End of the year is usually the busiest time for most people. This is a fact and I’m used to it. But I didn’t really expect that MY end of the 2014 would be the busiest and the most stressful I’ve had. I will get into more details about the house disaster we had in late October when I write my ‘wrap up for 2014’ post. Hence I was so grateful- (more grateful than a parched wanderer in the Sahara given a bottle of iced water) to take a little time off this month to go Byron Bay. The moment the plane started its descent into Ballina, I knew I would be in a completely different world. Far away from chaos. Everything was green and lush. And the lovely weather! Even though Byron Bay is in New South Wales, it is closer to Queensland, so the weather is just right. Not too humid. 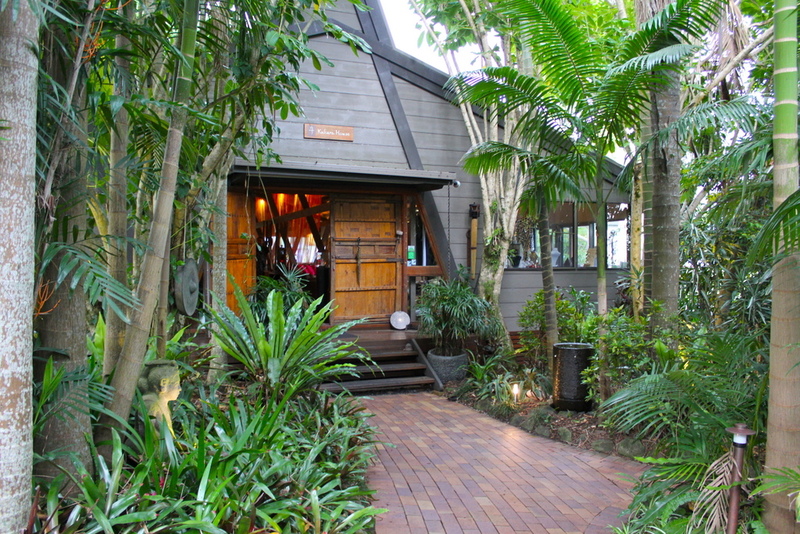 I am in Byron Bay to spend a couple of nights at the award-winning Gaia Retreat and Spa. I couldn’t be more excited to visit as this came at the right time, and also Gaia Retreat & Spa had just been awarded (for 2 years in a row) “Australia’s Leading Boutique Hotel” and “Australia’s Leading Spa Resort” at the 2014 World Travel Awards held last October. Co-founded by the ageless Olivia Newton-John, this almost 10-year old spa and retreat sanctuary has been consistently winning travel awards in the Spa & Wellness category, and those 2 titles are just the latest. 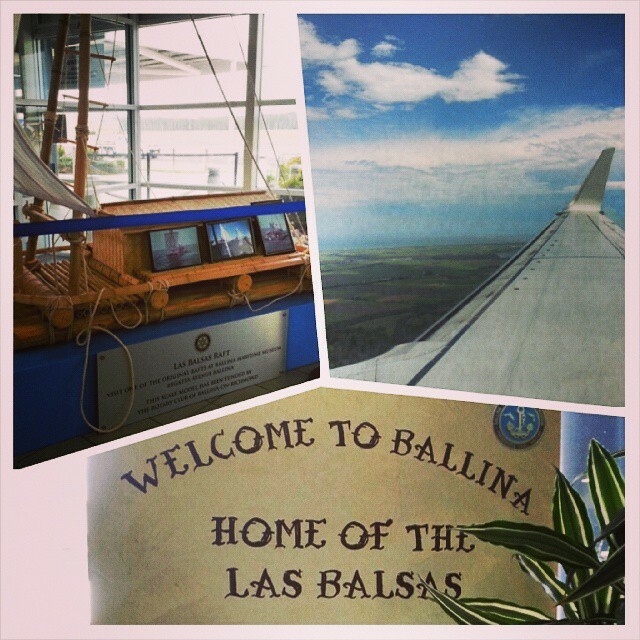 I was picked up by a private transport service from Ballina Airport. Gaia offers complimentary transfers at set times (but if you feel like splurging, helicopter transfers are available upon request too). Grant, my driver for the 20-minute ride from the airport to Gaia, is a proud resident of Byron Bay. He is originally from Sydney but a random visit to Byron Bay almost 20 years ago changed everything. 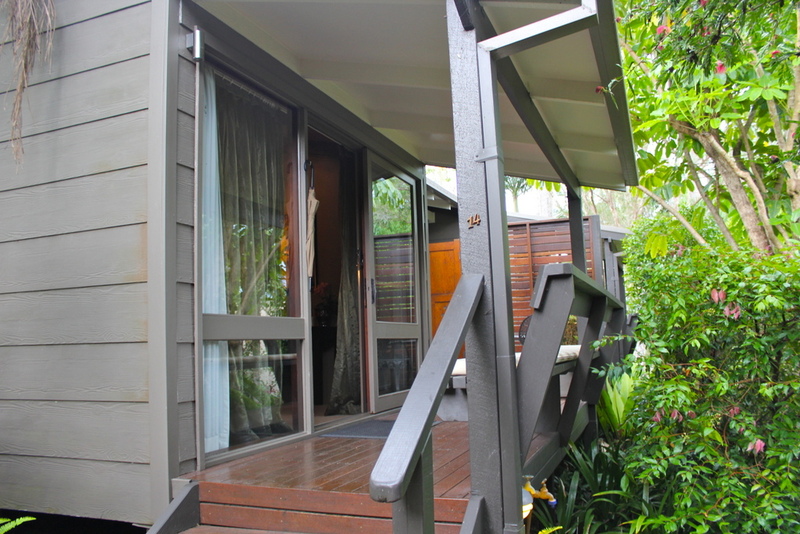 He says that the moment he set foot on Byron Bay, he knew he just had to move. I cannot blame him one bit. In the short 20 minute ride, I was able to see lush greenery. Not totally tropical, but just very vibrant and with mountainous background. The earth is a very distinct red – from it being volcanic, and Byron Bay receiving high rainfall annually. This means too that the landscape has made it easy for growing crops. Macadamia, avocados, blueberries and custard apples are just among the crops that thrive in the area. I arrived in Gaia around 4:30 PM. It had just rained, and I was surrounded by the pleasant smell of petrichor. Petrichor , a word I cannot pronounce, is one of those “ah-so-THAT’S-what-it’s-called” new words. 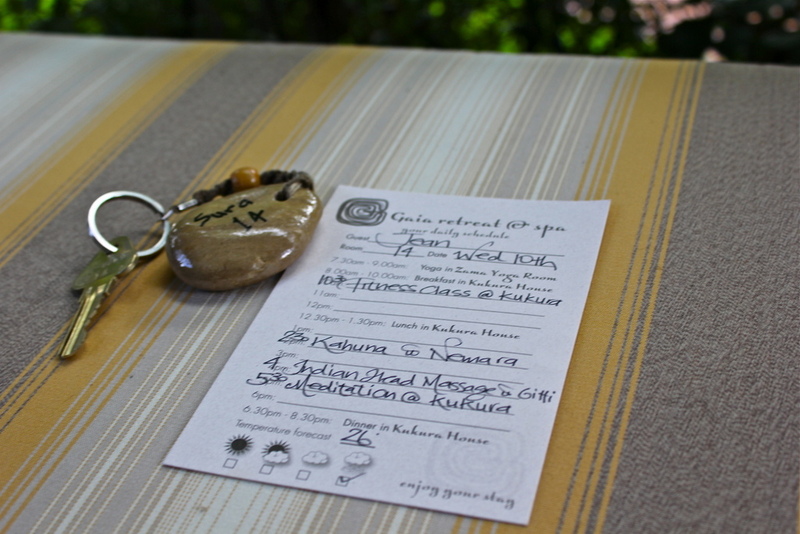 Check-in was done inside Kukura House. 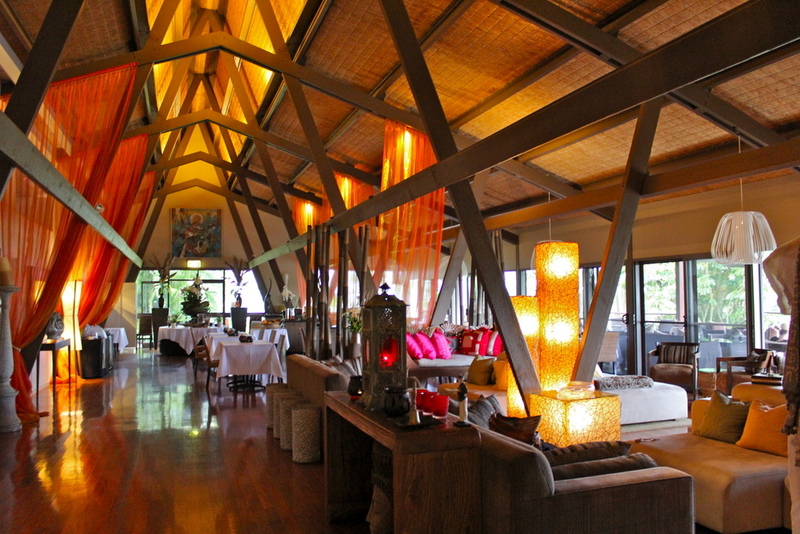 While all accommodation at Gaia are individual villas/cottages, Kukura House is a common area where check-in, reading and all manners of socialising happens. This is also where all meals – breakfast, lunch and dinner, takes place. 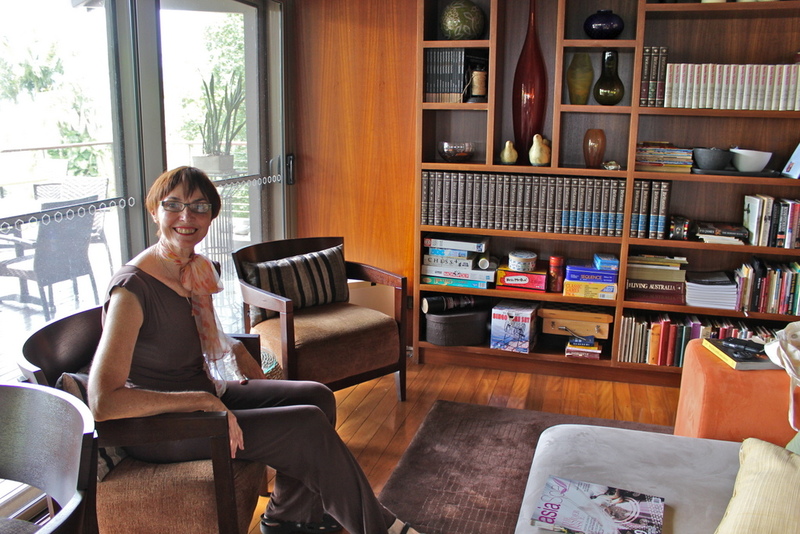 Despite it being a common area, it’s a very quiet and serene atmosphere inside Kukura House. 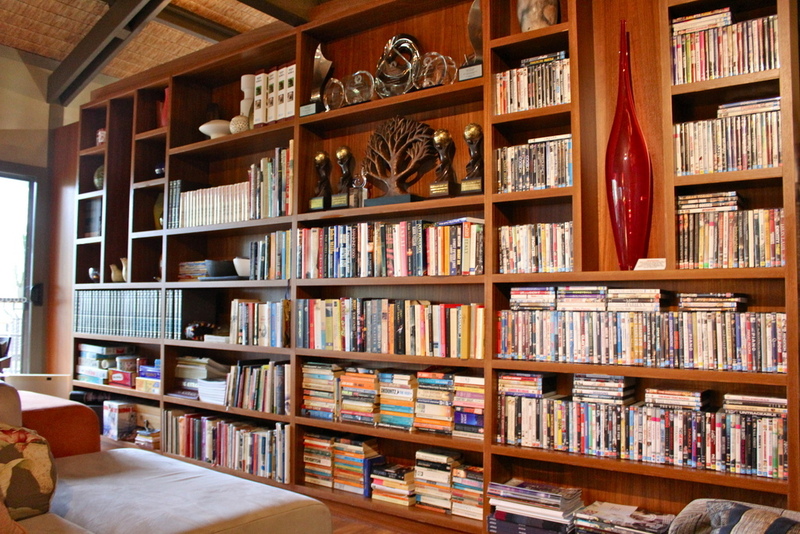 Guests calmly walk around, leisurely browsing what books or DVD’s to watch for the night. 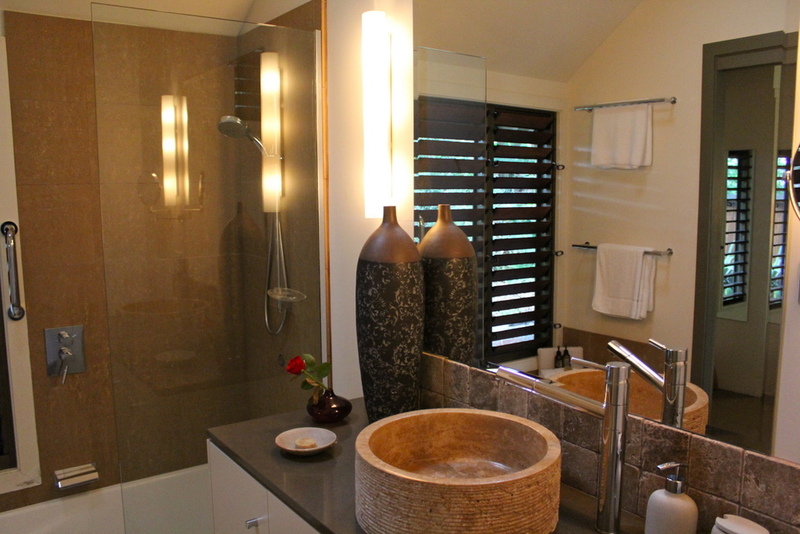 There is no Wi-Fi in the villas and rooms of Gaia, and this is quite understandable as this is a retreat. One’s time away from the daily stresses of life, and that includes connectivity to social media or any reminder of ‘real life’. I was then personally led to my room by Adam. I was booked to stay at the Sura Terraces, overlooking the gardens. 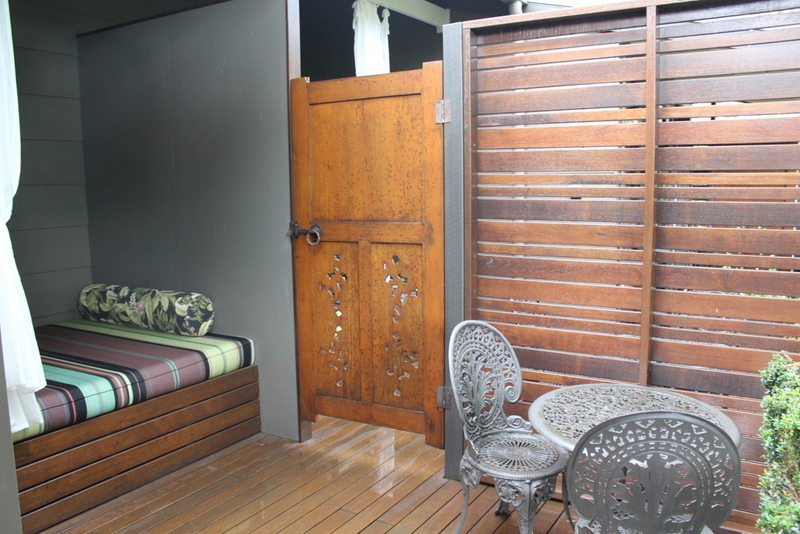 It’s a King bedded room with a balcony, a mini-garden for a backyard, and a Kind-sized day bed located in the balcony. 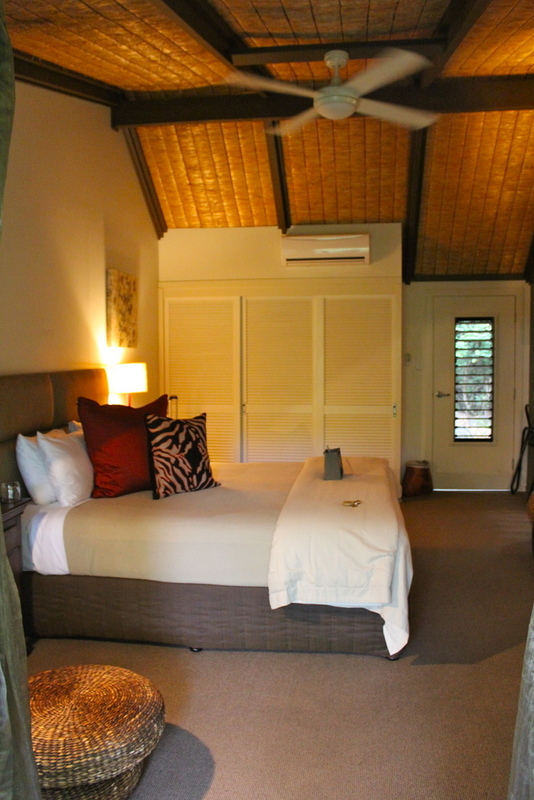 The room is air-conditioned but also has a ceiling fan. It was lovely to sleep with just the fan and windows open. There’s a flat screen TV, a DVD player, and tea / instant coffee making facilities. The bathroom was well-equipped with Gaia’s own brand of toiletries. I love their shampoo – it is really gentle and I can tell does not contain parabens. There is also a hairdryer. And apart from the toiletries in the bathroom, I also had another set of toiletries as gift, part of the Revive Package. 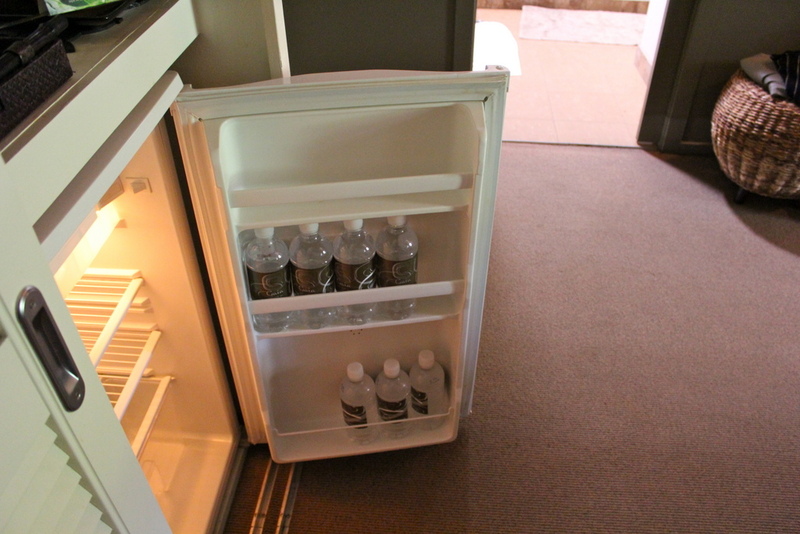 A big kudos to Gaia for supplying guests very generously with water. 4 full sized bottles a day. Health really does come first here! Generous supply of water ! 6:30 PM, Dinner begins at Kukura House. Guests one by one make their way to Kukura House. Many travelled solo but have now formed friendships over fellow solo-travellers. Seat preference at the dining room is very free. If you are travelling solo, you can join a round table to mingle with other travellers. Should you wish to dine on your own, it is also not a problem. Gueststravelling in pairs usually are couples or mother-daughter guests. 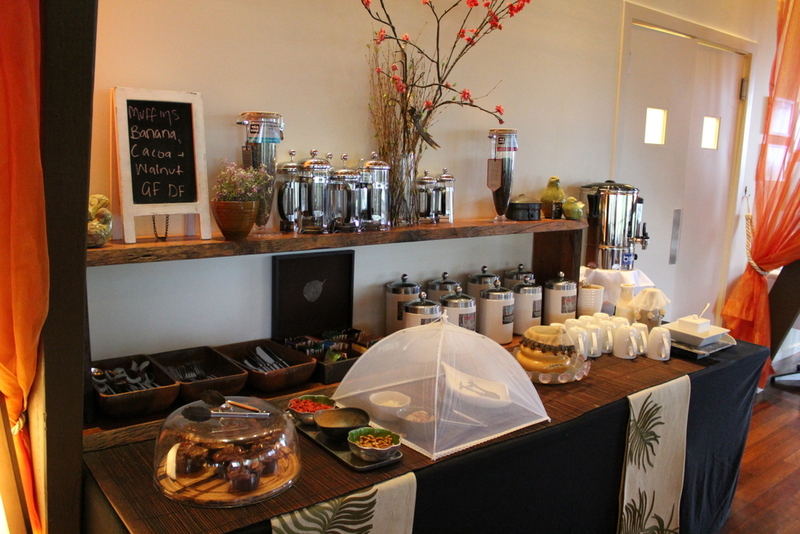 Although there are set times for breakfast, lunch and dinner, there is a snack table open the entire day with gluten-free muffins (each day is different), fruits and nuts. This is available the whole day and open to all guests. 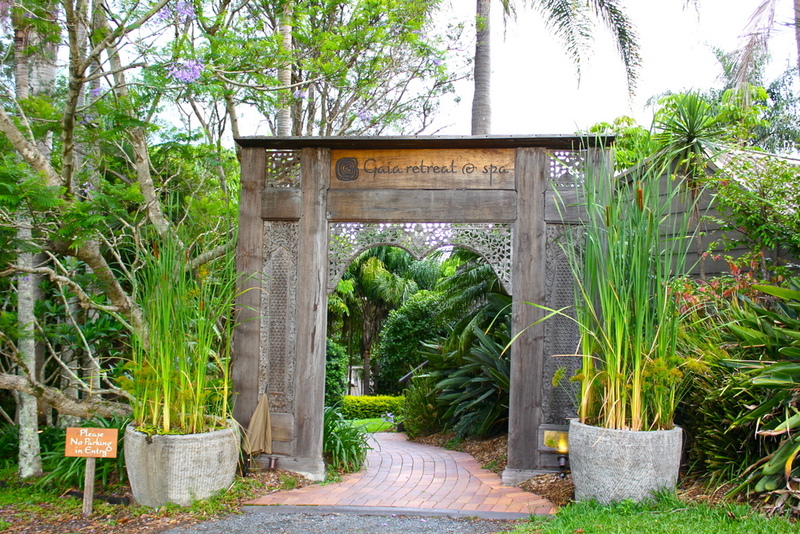 Gaia Retreat has its own organic farm. All produce from the farm are served for meals. Weeks prior to my arrival, I was sent a very thorough form to fill to notify them if there are any food preference / allergies or if you are under any particular diet or medication. None whatsoever for me. I am here to take all that Gaia has to offer. I’d been looking forward to be fed the “Gaia way”, which is really clean and organic. I normally live on a 20/80 diet (20 percent bad food / 80 percent clean). 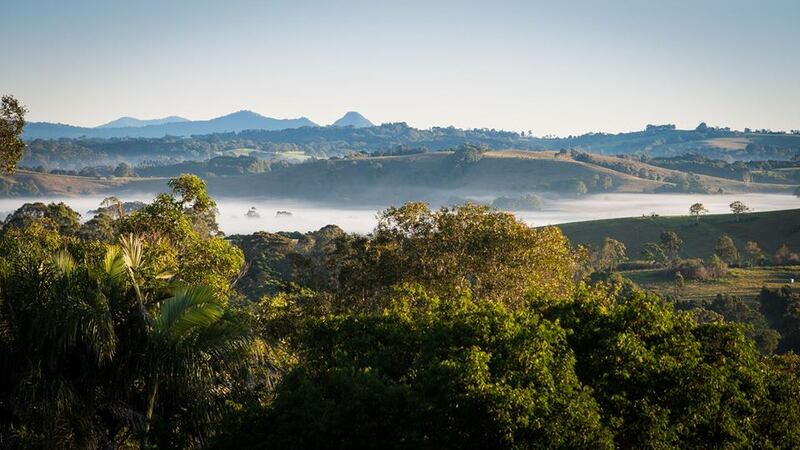 Gaia prepares a very balanced diet for their guests, sourced from their organic garden and from the orchards and plantations of the NSW Northern Rivers region. All dinners are 3-course meals. 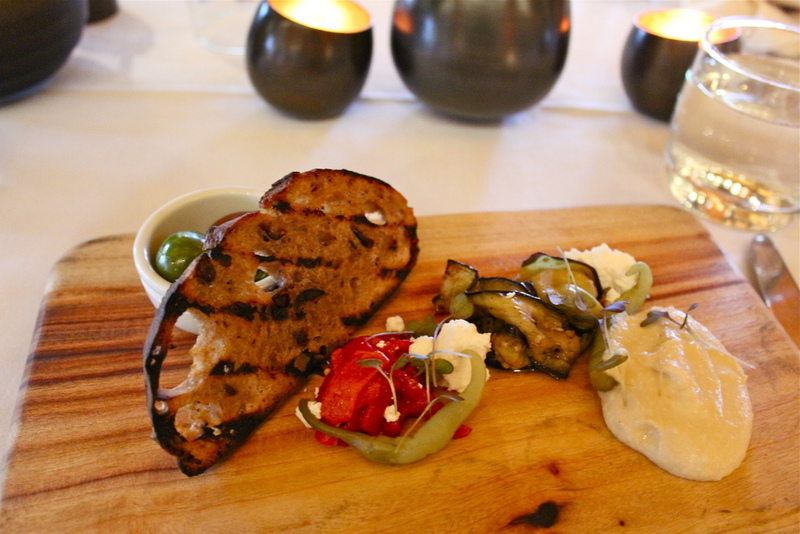 The starter for the first night: Mezze plate consisting of: Eggplant, peppers, goat’s cheese, pickled chilli, hummus, olives and thyme. The eggplant and hummus were really excellent to pair with the bread slice. I prefer this serving size of the starter. Starters are to whet one’s appetite, not act as a second or smaller main, which is what our most bodies have been accustomed to with modern living. 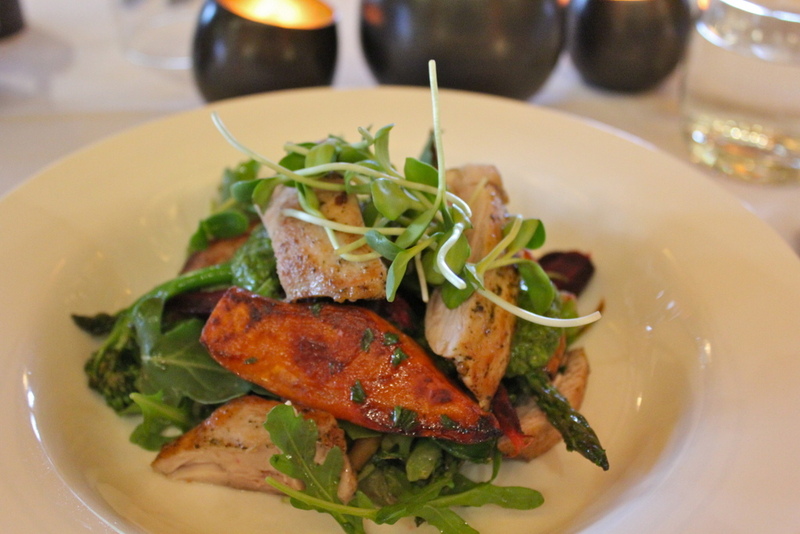 For the main dinner, it is a warm salad of grilled chicken, sweet potatoes, spring vegetables and salsa verde. A very balanced meal of protein and vegetables. The chicken are all white meat, which I’m so happy about. The sweet potato was really fresh and paired with ‘cool’ vegetables, it was all around an excellent combination. Dessert came shortly. 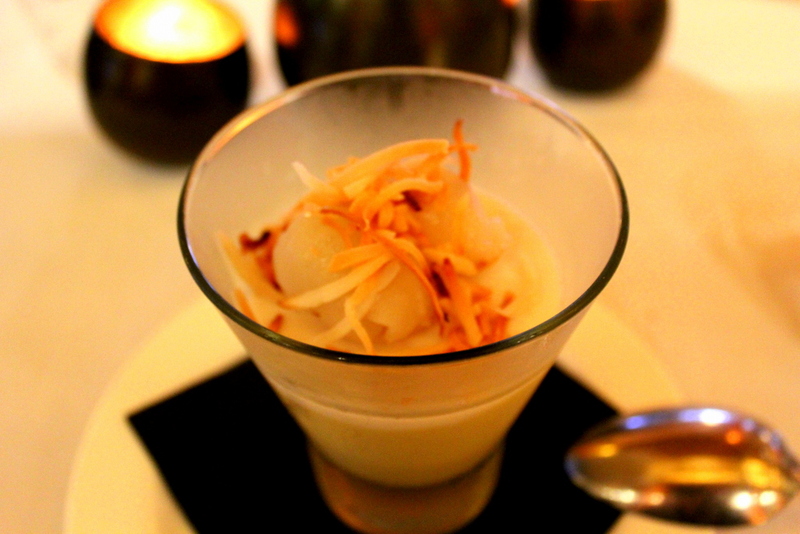 This one is mango mousse with lychees and toasted coconut. Those on a sugar-free diet will rejoice as this dessert did not contain any additional sweetener (both natural and sugar). All sweetness came from the fruits. I can tell that all 3 meals were made from the cleanest and freshest ingredients. For one, I was able to finish all plates. I normally wouldn’t be able to finish a dessert on my own if I had finished a proper sized main meal. To my delight, I finished everything with a great feeling that my body had just been nourished, and not stuffed. After dinner, I was handed my schedule for the next day. I called it an early night – 10:30 pm – 11:00 pm I was asleep. And this is really early for me. The wonders of no Wi-Fi! I slept very soundly and woke up around 9am. I was able to explore the grounds of Gaia that morning. 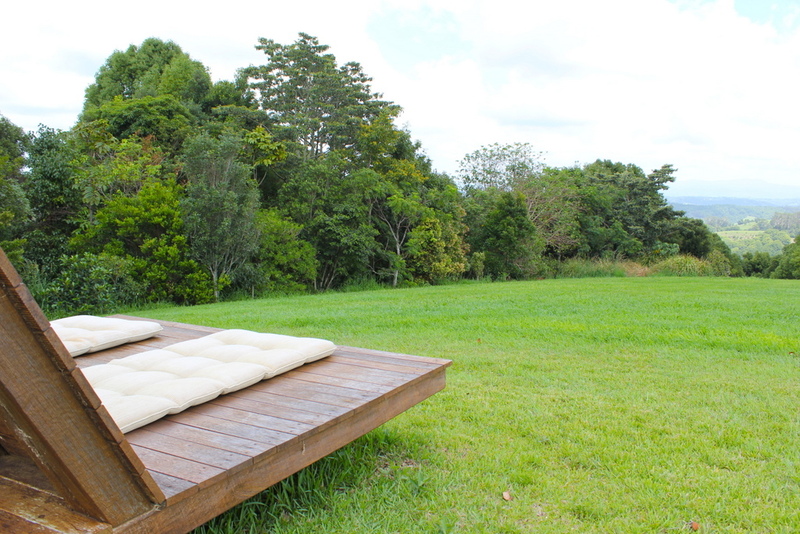 With 19 rooms in total, Gaia is poised on the highest point in the shire and set on 25 acres. It was so great to walk around after eating or first thing in the morning. 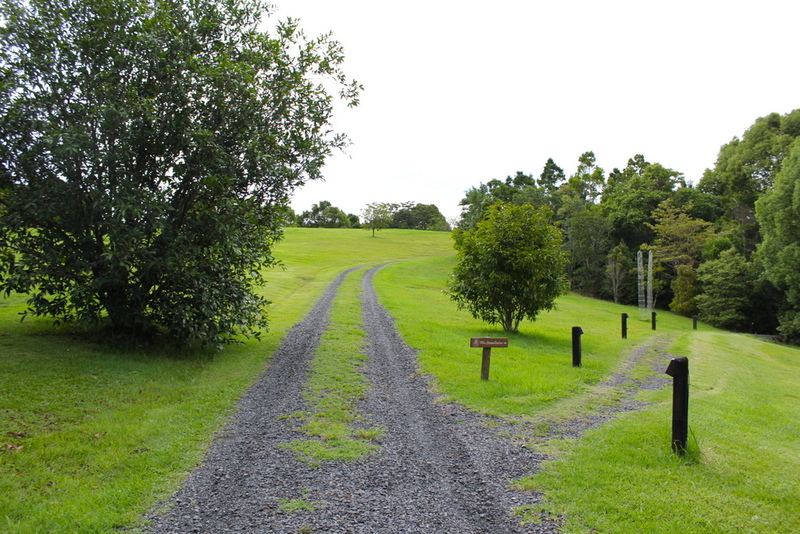 There are 2 types of tracks around Gaia – The 1 Km Easy Stroll and the 1.5km Gaia Walking Track. What I did that morning though, was head up to the Samira Lookout point. This was so serene, being up there on my own. There were lounges that have been perfectly situated in vantage view points of the hill so it was really good to sit there, or even just stand on top of the rock slabs to take upon the view. I spent quite a good time walking up and down the hill, and some parts of the track. When I returned to Kukura House, it was 11:30 am. 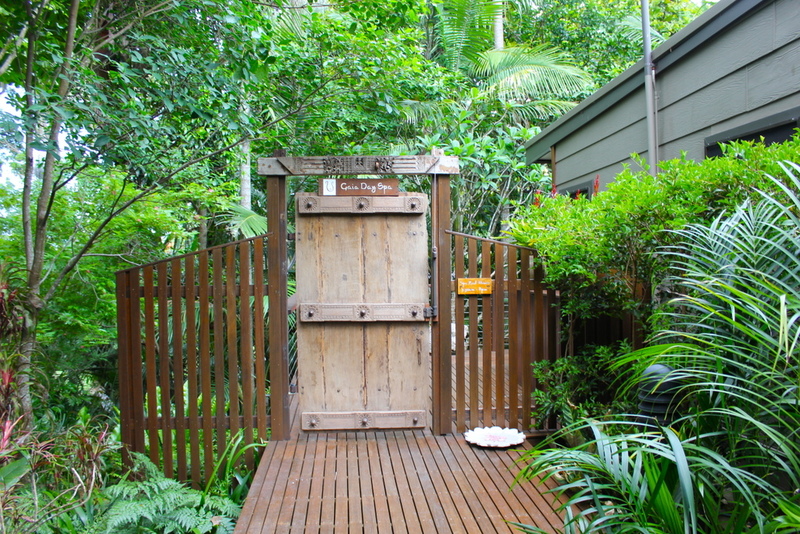 Everyday, there are sessions / talk available at Kukura House such as: meditation, herbs and plants, etc. That morning, I had a one on one session on Esoteric Healing with Nicolette. Nicolette is one of those persons whose aura just radiates positivity, calmness and good health. She has had over 30 years experience of Beauty Therapy and ongoing study of energetic awareness. Prior to this morning, I have not really heard about Esoteric Healing. Nicolette explained the basic fundamentals of Esoteric Healing – it is the belief that it is the way we live our lives, and the choices that we make which directly contributes both emotionally and physically to our well-being and disease. To a certain extent, I do believe in this. The power of the mind (which is our outlook in life and therefore creates our life decisions) controls our health. I do not mean by just “thinking” you are healthy – but when you think positively, your actions will follow through as well. Nicolette explained that our stresses and negativity, when harboured in our minds (and therefore our bodies), will find a way to escape or cause imbalance in our bodies and this is when symptoms (such as pain) arise. She performs Esoteric Healing and Esoteric Massage sessions in Gaia. Though I wasn’t able to have an actual healing or massage session with her, it was really interesting when she said she can feel (just by placing her palm over the heart and chest of a client) if they have a lot of negative energies and stresses that they are carrying. It was an enlightening session indeed, and next thing I know it was lunch time. As I headed to the dining tables, I heard a small commotion. 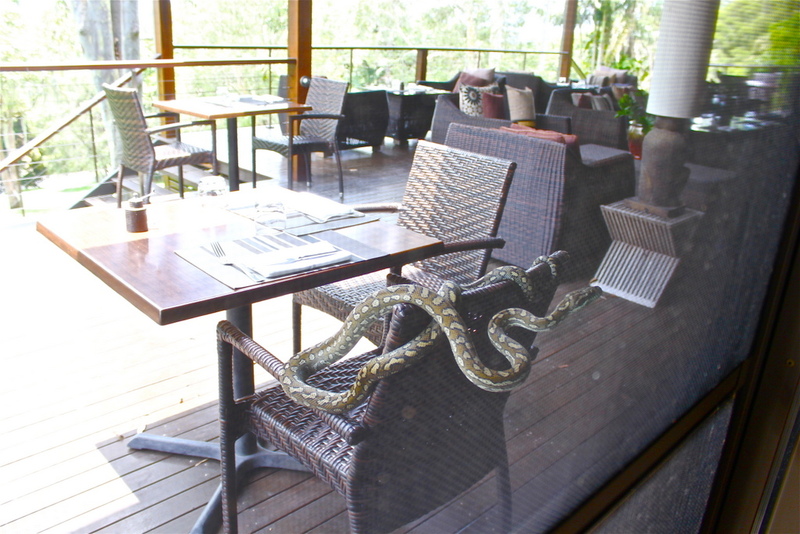 Apparently, we had an unexpected diner waiting for his lunch. The python as calmly removed and brought back to the grassy area. This is testament to how nature abounds in Gaia. Today’s lunch is a vegetarian Japanese stir-fry. The healthiest stir fry I’ve had. 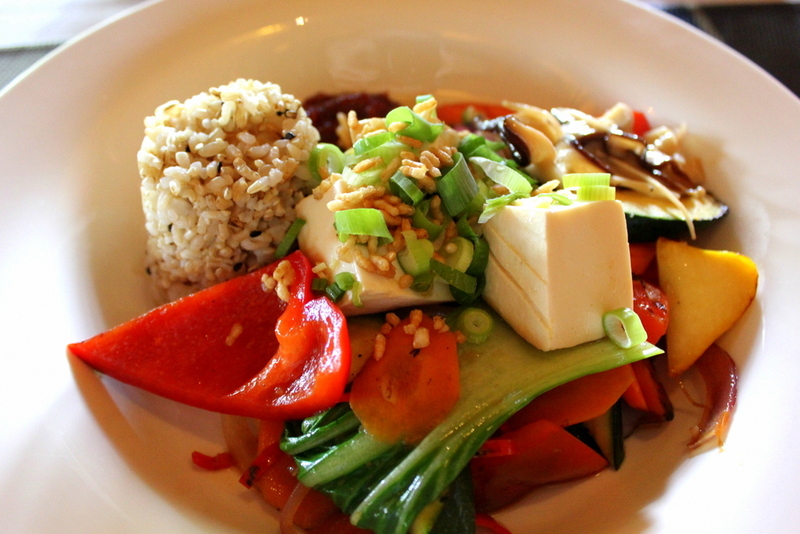 Brown rice with big and fresh chunks of tofu, capsicum, bok choy, squash, eggplants, zucchini and carrots. I like the toasted rice topping, adding extra crunch to the entire meal. 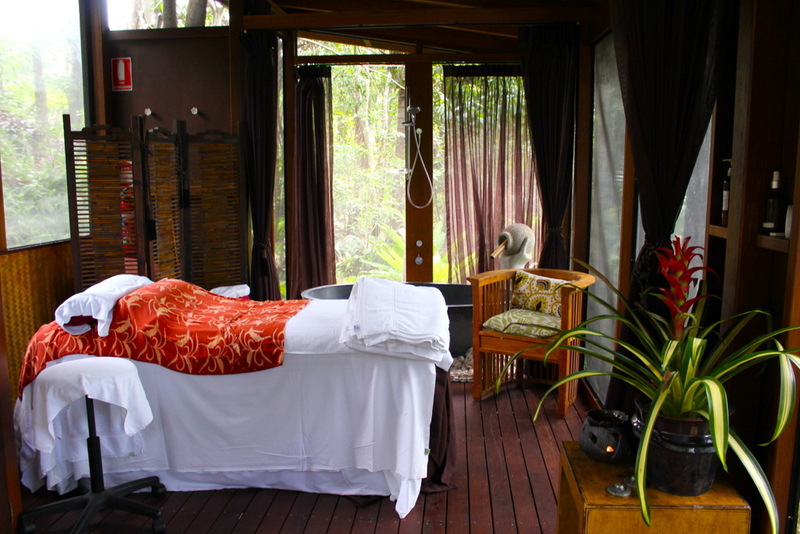 A week before I arrived at Gaia, I received a phone call from the Gaia Spa asking me for my treatment preference. I asked for the most relaxing treatment, and I was suggested the Kahuna Massage. I have not had a Kahuna massage before so I was really looking forward to the treatment. Kahuna is a therapeutic massage technique based on the teachings and practices of the ancient Hawaiian Kahunas. 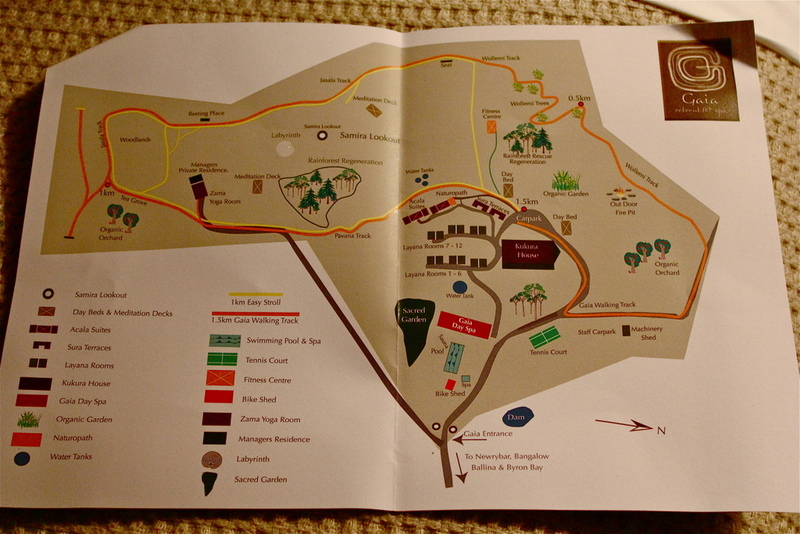 My masseuse, Nemara led me to the massage room, which was literally surrounded by trees. 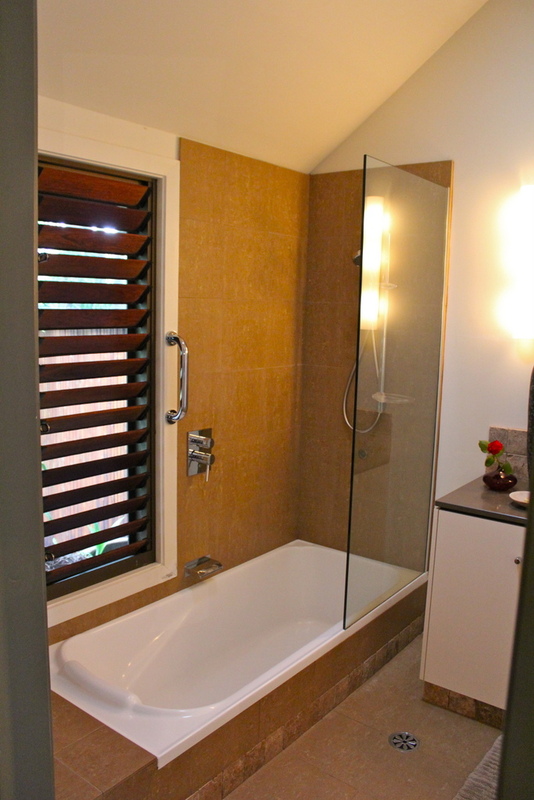 It had screen windows all over, so it gives a feeling of being in an outdoor massage room, but with privacy as this massage room was really well-hidden in the midst of trees and lush (almost) forest. Nemara explained to me in detail what was about to happen in a Kahuna massage. First of all, the main difference between a Kahuna massage and other massages I’ve had before is that the masseuse uses her forearms , and not just the hands. The movements are long and swift, with the masseuse massaging the body from underneath as well. As this is a vigorous massage (for the masseuse), breathing is a big element in Kahuna. Nemara started the session with a chant, and throughout the massage, she was focused on her breathing (deep breaths while performing the massage.) I say performing because Kahuna is almost like a dance for the masseuse. By the end of the massage, I felt very invigorated and awakened. I was then told to stay put lying on the massage table, as another masseuse entered to give me a 30-minute Indian head massage. The entire 90-minute treatment left me in a state of drunken headiness and bliss. 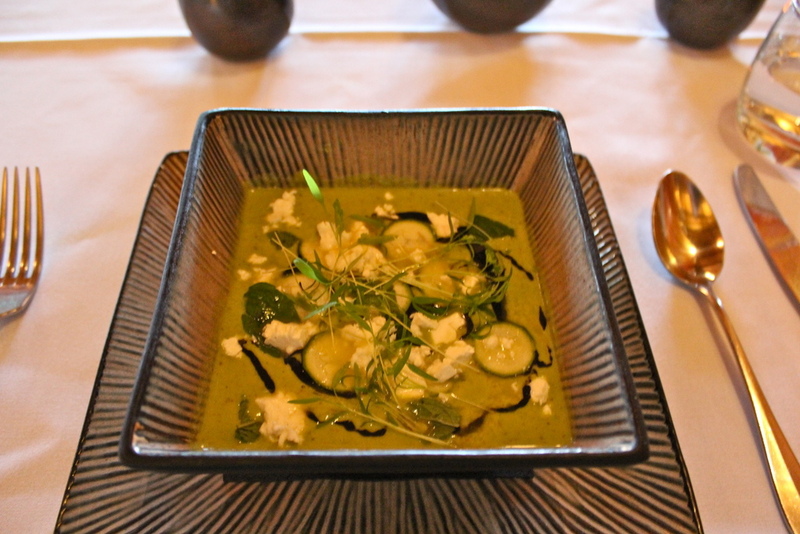 Dinner started with chilled pea soup with tahini and feta. This was really nice and refreshing, though I wish it was warm as I’m not used to cold soups. 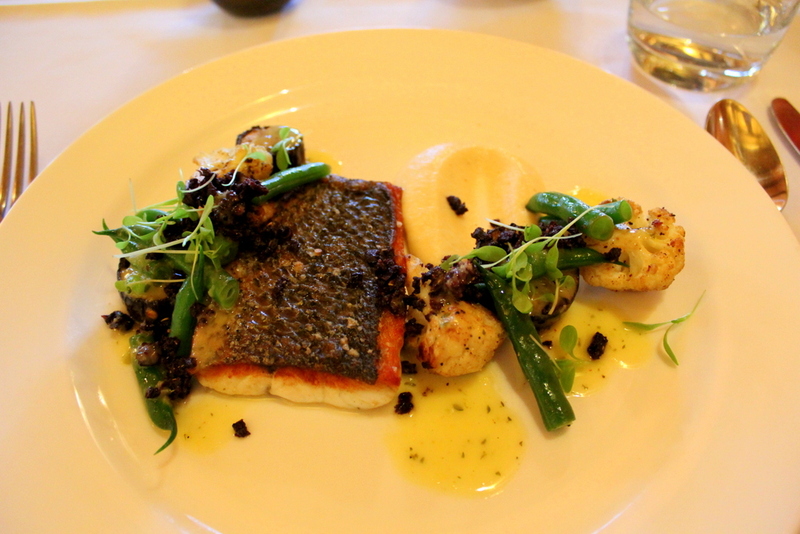 This main course is my favourite among all meals I’ve had at Gaia. Panfried Dhufish with cauliflower. Gaia serves only line-caught seafood and this was exceptionally fresh. The meat was so sweet and tender. 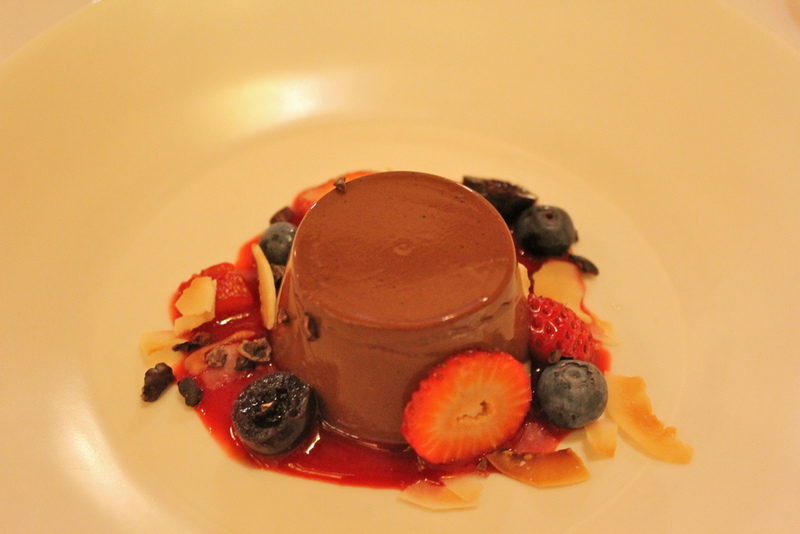 Dessert was chocolate pannacotta with berries. Again, no unnatural sweeteners for this dessert. And I did enjoy this chocolatey, velvety pannacotta. That night, after a long and luxurious shower, I read a book until I fell asleep. I can’t remember the last time that happened! And this is where I’m thankful for the intentional limited wi-fi in Gaia. It forced me to do all other things that I used to preoccupy myself with pre-wi-fi days. 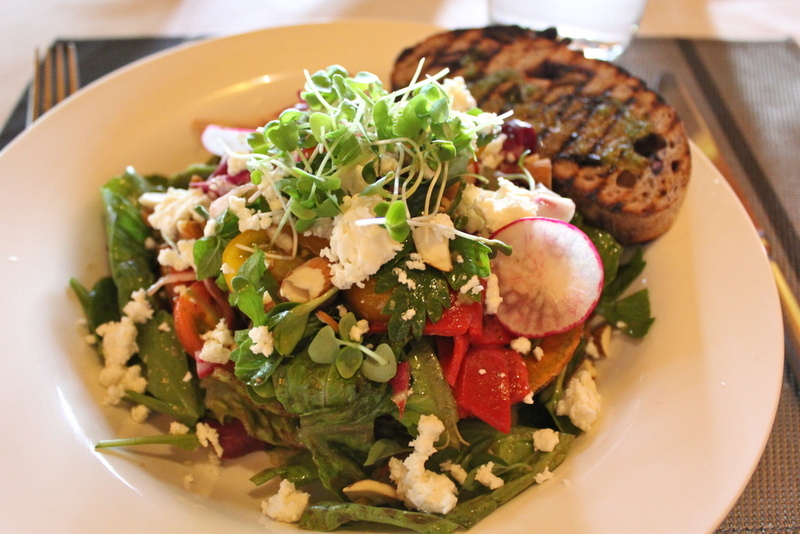 The next day, I slept till 10 AM, packed, and had my last meal at Gaia. This was a very healthy and filling lunch salad of feta, greens, sweet potato and bell peppers. I had an hour more after lunch, and was promptly picked up and was driven back to Ballina Airport. My 2 night stay at Gaia had been one of my most relaxing and reflective days. I was really thankful for the lack of wi-fi as I needed time to slow down and think on the numerous and fast events that happened for the year 2014. With my stay, I’ve learned so much more about living a better and healthier life. And I plan to incorporate these knowledge in real life. And more importantly, I came out of Gaia refreshed, renewed and ready to face 2015. 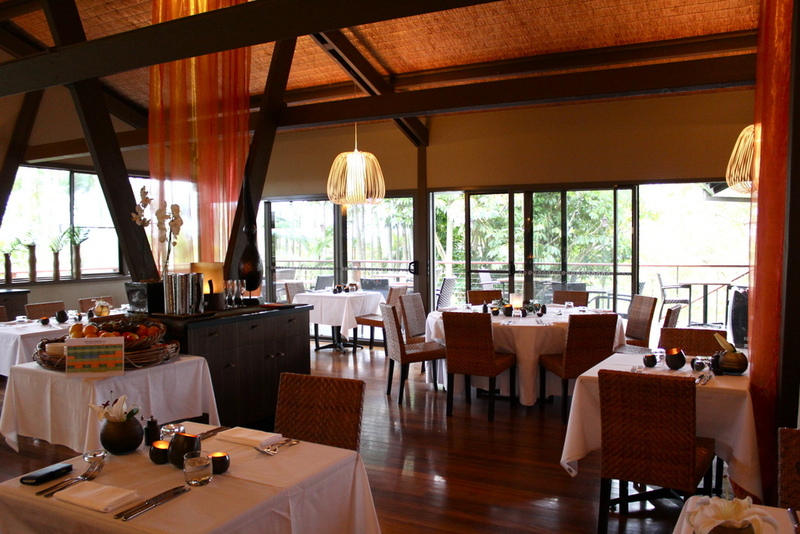 The Gaia Revive Package at the Sura Terrace starts at AUD 1470.00 for a single guest and AUD 2350.00 for couples. 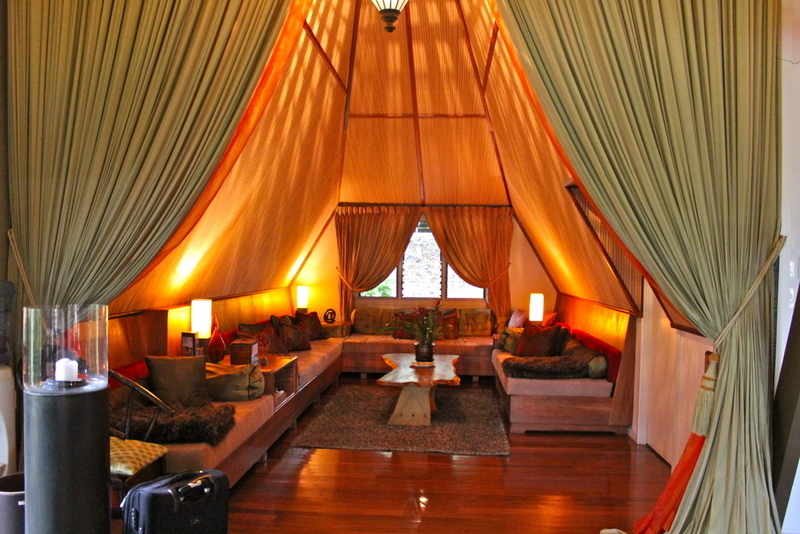 It includes 2 nights accommodation, use of all facilities, all meals and a 1-hour treatment. Have you been in a spa retreat before, and how was the experience? I was a guest of Gaia Resort & Spa, however this does not hold any bearing on my thoughts. All opinions of this blog are mine. I haven’t heard about Gaia in a while. I remember when it first opened and the ONJ connection. 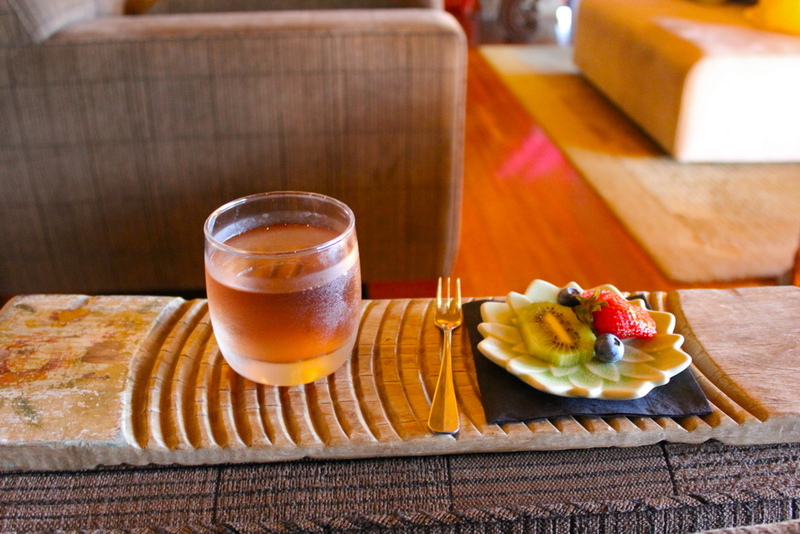 It sounds similar to the Bali Goddess retreat that I loved this year. My favourite part was the endless spa treatments-heavenly! Hi Lorraine, yes that’s what I thought of too – your Bali Goddess retreat 🙂 The spa treatments plus eating well with food prepared and chosen for you — I think we can live eternally if we did that everyday! this sounds divine. 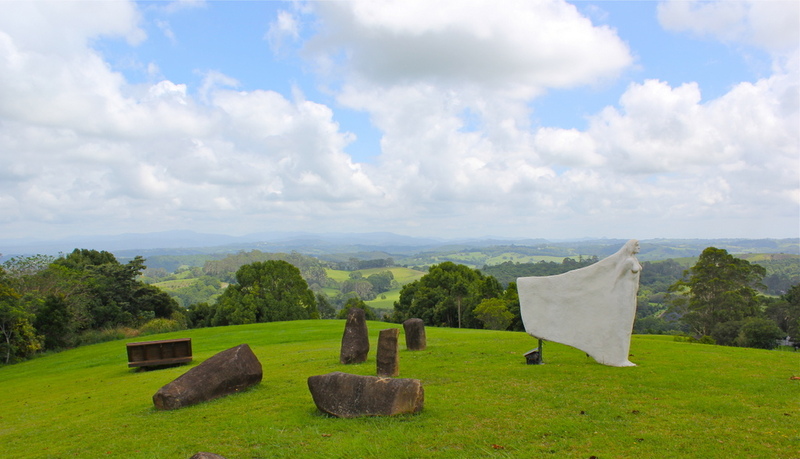 we are in brisbane so it is only a short drive to northern nsw so we often go down there. it is my fave place in the world. so beautiful, so peaceful. full of food and fun, and art and just glorious. Hi Sherry! How lucky you live so close to this paradise- yes, it’s quite a different world up there. The food and environment alone is like chicken soup for the soul and well being 🙂 Happy New Year to you too! All the yes, what a magical experience. I have had this on the bucket list for a while now, reckon I better make it a thing this year. 🙂 I haven’t done a retreat as such, but have booked week long spa packages on top of my travel. Daily massage, scrubs, thermal pools, saunas and ceramic heat beds. They suggested foods for you to eat, but we had to prepare it. #nodeal It really was lovely, but not as great as being at a dedicated place like this. Yes spa weekends/retreats are really great especially for detoxing both the mind and the body after busy months and weeks at work! A friend of mine went last year and really enjoyed her stay. So enjoyed your review as I now feel I know exactly what to expect, all the photographs show it so well. Lovely.